A cloud chasers dream! Eighteen adjustable airflow holes provide unbelievable clouds of your favorite ECBlend Dragon's Series. THESE PRODUCTS ARE FOR ADVANCED USERS ONLY - THERE IS NO SUPPORT ON THESE ITEMS. Note: ALWAYS test new coils using an ohm meter before using. Plastic ring for adjustible screw got stripped and pushed up with my bottom trigger tube. Best used with a box or tube with a button on the side. It still functions, but I placed it on a box and gave it to a friend. Completely my fault for trying to eek out the last of the battery on long car rides. SOOO -> The airholes are awesome for adjusting flow, because you can flip the tube for adjusting the placement of the holes to go from the bottom under the coils or right in front of the coils. VERY easy to build on with a couple gauges of wire. Offers a reasonably deep 4mm well. This atty is awesome. I have NO regrets purchasing this. 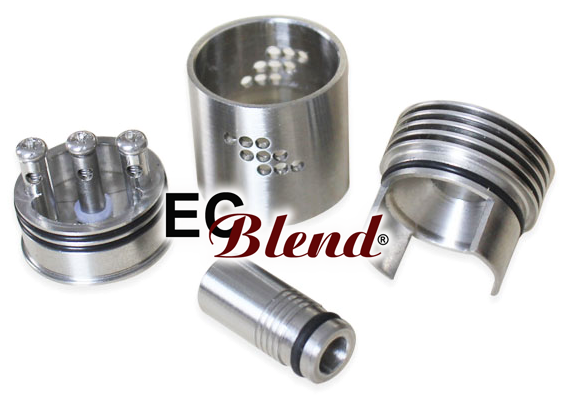 High quality stainless steel and very deep juice well. I can take about 10 or more vapes before having to drip again. Great airflow control, produces good flavor too. Five stars any day. I can't find ANY flaws. Click the button below to add the Rebuildable Atomizer - Tobeco - Mutation X to your wish list.